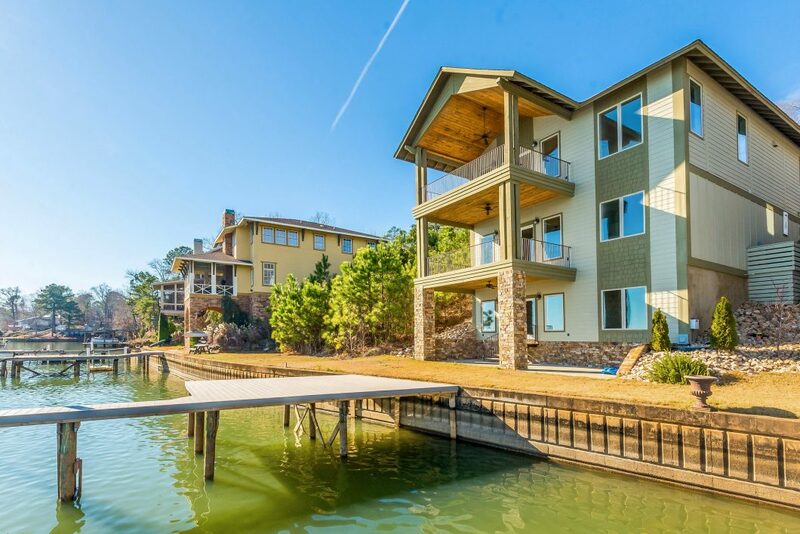 Enjoy incredible views from 69 Eagle Point at Lake Martin! From this home you have a 3.5 mile view looking towards Sand Island and where you turn to Kowaliga. Just ask the wooden Indian himself! This new three bedroom, three bath home is ready for you to move right in and start enjoying the lake. The interior of this home is loaded with great features such as white washed shiplap walls, stamped concrete floors on the lake level – wood floors on the other two levels, a custom vent hood, herringbone pattern subway tile in the kitchen along with stainless appliances, granite countertops, custom cabinets, a bar area, a desk area and a pantry. The top level (which is street level) has a large open concept living, dining and kitchen area as well as a bedroom and full bathroom. The living room has a beautiful stone, gas burning fireplace. The master suite is on the second level and has two large walk in closets and a spacious bathroom. And the view of the lake from the soaker tub in the master bath is amazing! The home includes a large laundry room on the second level with a sink and granite countertop which will be perfect for folding all of those beach towels you will be using. A bonus space on the lake level could be another bedroom/bunk room, game room or office. Also on the lake level is a kitchenette with a large refrigerator and microwave, a great living area space a large bathroom and a bedroom. All three levels of 65 Eagle Point have porches so you are never far from the view of the lake. All three porches have wood ceilings with the top level porch having a vaulted ceiling. There is also a garage which is nice to have for storage as well as to park. There is little to no landscaping work to be done so there is no need to spend your time at the lake mowing grass. The only time you will spend picking up sticks is if you want to play the Pick Up Sticks game instead of Monopoly on family game night! 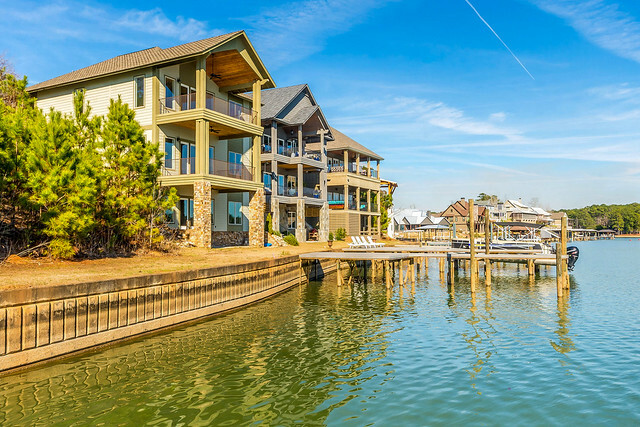 From your private pier just take a quick boat ride to Willow Point to play golf or to SpringHouse, Catherine’s, Kowaliga or The Landing at Parker Creek to have dinner. 69 Eagle Point is located on the west side of the lake so it is convenient to Birmingham. Note: Don’t just Google map this address, GMaps sends you to the wrong place! From Alex City: Take Hwy 22 West, left on Hwy 259, left on Coosa Co. Rd. 20, at the end of Coosa 20 take a right on Eagle Point by rock retaining wall.